Taxes are not the most popular policy, but they are often necessary. We will look at two methods to understand how taxes affect the market: by shifting the curve and using the wedge method. First, we must examine the difference between legal tax incidence and economic tax incidence. When the government sets a tax, it must decide whether to levy the tax on the producers or the consumers. This is called legal tax incidence. The most well-known taxes are ones levied on the consumer, such as Government Sales Tax (GST) and Provincial Sales Tax (PST). The government also sets taxes on producers, such as the gas tax, which cuts into their profits. The legal incidence of the tax is actually irrelevant when determining who is impacted by the tax. When the government levies a gas tax, the producers will pass some of these costs on as an increased price. 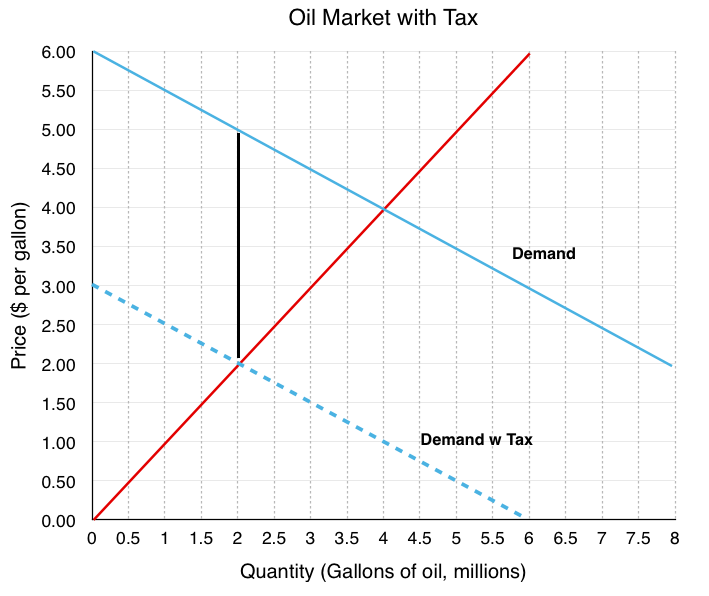 Likewise, a tax on consumers will ultimately decrease quantity demanded and reduce producer surplus. This is because the economic tax incidence, or who actually pays in the new equilibrium for the incidence of the tax, is based on how the market responds to the price change – not on legal incidence. In Topic 3, we determined that the supply curve was derived from a firm’s Marginal Cost and that shifts in the supply curve were caused by any changes in the market that caused an increase in MC at every quantity level. This is no different for a tax. From the producer’s perspective, any tax levied on them is just an increase in the marginal costs per unit. 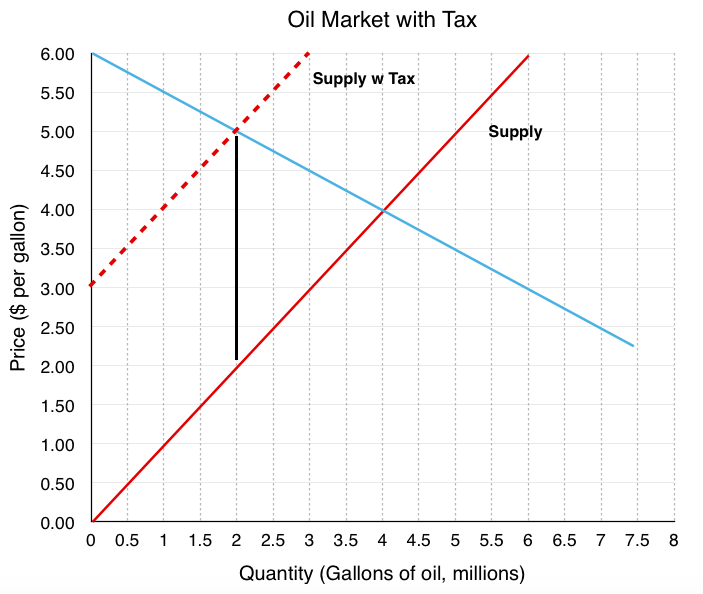 To illustrate the effect of a tax, let’s look at the oil market again. 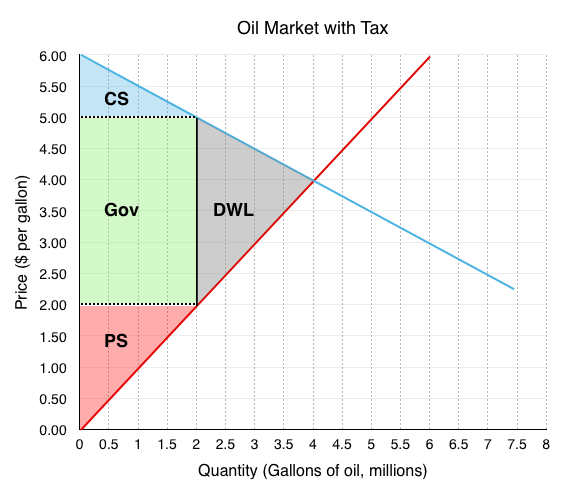 If the government levies a $3 gas tax on producers (a legal tax incidence on producers), the supply curve will shift up by $3. As shown in Figure 4.8a below, a new equilibrium is created at P=$5 and Q=2 million barrels. Note that producers do not receive $5, they now only receive $2, as $3 has to be sent to the government. From the consumer’s perspective, this $1 increase in price is no different than a price increase for any other reason, and responds by decreasing the quantity demanded for the higher priced good. What if the legal incidence of the tax is levied on the consumers? 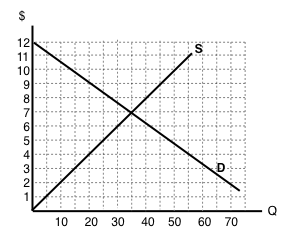 Since the demand curve represents the consumers’ willingness to pay, the demand curve will shift down as a result of the tax. 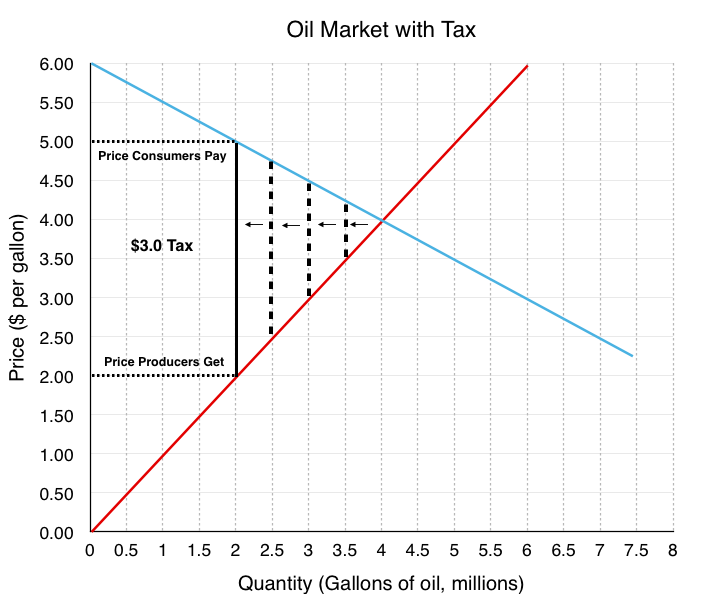 If consumers are only willing to pay $4/gallon for 4 million gallons of oil but know they will face a $3/gallon tax at the till, they will only purchase 4 million gallons if the ticket price is $1. This creates a new equilibrium where consumers pay a $2 ticket price, knowing they will have to pay a $3 tax for a total of $5. The producers will receive the $2 paid before taxes. Note that whether the tax is levied on the consumer or producer, the final result is the same, proving the legal incidence of the tax is irrelevant. Another method to view taxes is through the wedge method. This method recognizes that who pays the tax is ultimately irrelevant. Instead, the wedge method illustrates that a tax drives a wedge between the price consumers pay and the revenue producers receive, equal to the size of the tax levied. 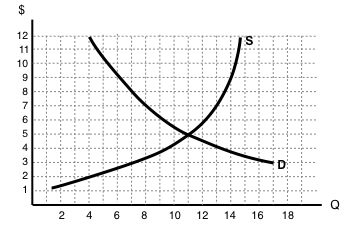 As illustrated below, to find the new equilibrium, one simply needs to find a $3 wedge between the curves. The first wedge tested is only $0.7, followed by $1.5, until the $3.0 tax is found. Like with price and quantity controls, one must compare the market surplus before and after a price change to fully understand the effects of a tax policy on surplus. In our previous examples dealing with market surplus, we did not include any discussion of government revenue, since the government was not engaging in our market. Remember that market surplus is our metric for efficiency. If government was not included in this metric, it would not be very useful. In this case a million-dollar loss to government would be considered efficient if it resulted in a $1 gain to a consumer. To ensure that our metric for efficiency is still useful we must consider government when calculating market surplus. As with the quota – both consumer and producer surplus decreased because of a reduced quantity. The difference is, since the price is changing, there is redistribution. This time, the redistribution is from consumers and producers to the government. Remember, only a change in quantity causes a deadweight loss. Price changes simply shift surplus around between consumers, producers, and the government. Let’s look closely at the tax’s impact on quantity and price to see how these components affect the market. 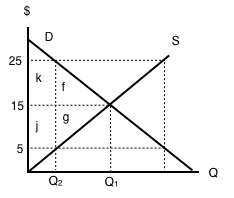 Due to the tax’s effect on price, areas A and C are transferred from consumer and producer surplus to government revenue. Consumers originally paid $4/gallon for gas. Now, they are paying $5/gallon. The $1 increase in price is the portion of the tax that consumers have to bear. Despite the fact that the tax is levied on producers, the consumers have to bear a share of the price change. The size of this share depends on relative elasticity – a concept we will explore in the next section. This is because a decrease in price to producers means quantity supplied is falling, and in order to maintain equilibrium, quantity demanded must fall by an equal amount. This price change means the government collects $1 x 2 million gallons or $2 million in tax revenue from the consumers. This is a straight transfer from consumers to government and has no effect on market surplus. Originally, producers received revenue of $4/gallon for gas. Now, they receive $2/gallon. This $2 decrease is the portion of the tax that producers have to bear. This means that the government collects $2 x 2 million gallons or $4 million in tax revenue from the producers. This is a transfer from producers to the government. As calculated, the government receives a total of $6 million in tax revenue, which is taken from consumers and producers. This has no impact on net market surplus. If we just considered a transfer of surplus, there would be no deadweight loss. In this case, though, we know that price changes come with a change in quantity. A higher price for consumers will cause a decrease in the quantity demanded, and a lower price for producers will cause a decrease in quantity supplied. This reduction from equilibrium quantity is what causes a deadweight loss in the market since there are consumers and producers who are no longer able to buy and supply the good. Due to the increase in price, many consumers will switch away from oil to alternative options. This decrease in quantity demand of 1.5 million gallons of oil causes a deadweight loss of $1 million. Producers, who now receive only $2.00/gallon for their production, will also decrease quantity supplied by 1.5 million gallons of oil. It is no coincidence that the size of the decrease is the same. 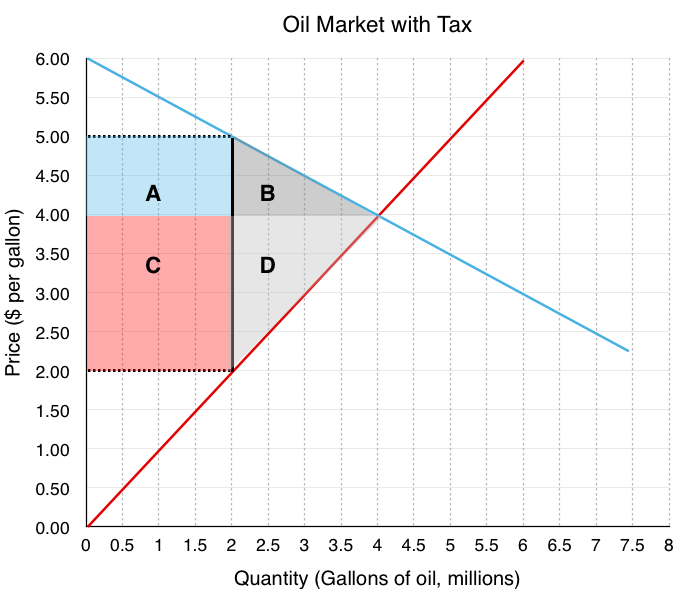 When you create the wedge between consumers and producers, you are finding the quantity where the full amount of the tax is incurred but the market is still at equilibrium. Remember that quantity demanded must equal quantity supplied or the market will not be stable. This mirrored decrease in quantity ensures this is still the case. Notice, however, that the impact of this quantity drop causes a larger decrease in producer surplus than consumer surplus totalling $2 million. Again, this is due to elasticity, or the relative responsiveness to the price chance, which will be explored in more detail shortly. Together, these decreases cause a $3 million deadweight loss (the difference between the market surplus before and market surplus after). While a tax drives a wedge that increases the price consumers have to pay and decreases the price producers receive, a subsidy does the opposite. A subsidy is a benefit given by the government to groups or individuals, usually in the form of a cash payment or a tax reduction. A subsidy is often given to remove some type of burden, and it is often considered to be in the overall interest of the public. 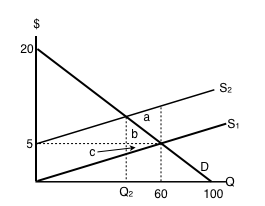 In economic terms, a subsidy drives a wedge, decreasing the price consumers pay and increasing the price producers receive, with the government incurring an expense. 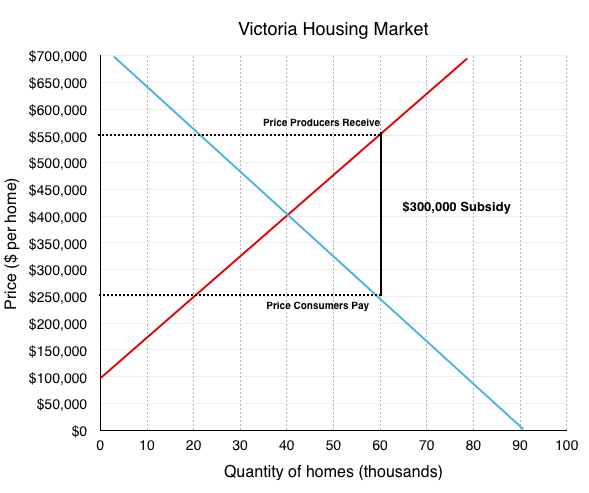 In Topic 3, we looked at a case study of Victoria’s competitive housing market where high demand drove up prices. In response, the government has enacted many policies to allow low-income families to still become homeowners. Let’s look at the effects of one possible policy. (Note the following policy is unrealistic but allows for easy comprehension of the effect of subsidies). In the market above, our efficient equilibrium begins at a price of $400,000 per home, with 40,000 homes being purchased. The government wants to substantially increase the number of consumers able to purchase homes, so it issues a $300,000 subsidy for any consumers purchasing a new home. This drives a wedge between what home buyers pay ($250,000) and what home builders receive ($550,000). With all government policies we have examined so far, we have wanted to determine whether the result of the policy increases or decreases market surplus. With a subsidy, we want to do the same analysis. Unfortunately, because increases in surplus overlap on our diagram, it becomes more complicated. 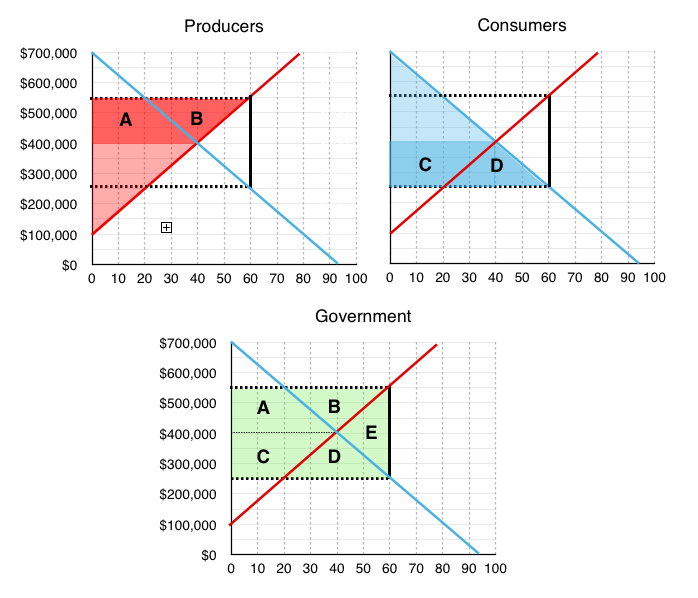 To simplify the analysis, the following diagram separates the changes to producers, consumers, and government onto different graphs. The producers now receive $550,000 instead of $400,000, increasing quantity supplied to 60,000 homes. 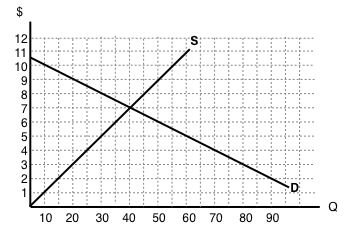 This increases producer surplus by areas A and B. The consumers now pay $250,000 instead of $400,000, increasing quantity demanded to 60,000 homes. This increases consumer surplus by areas C and D.
The government now has to pay $300,000 per home to subsidize the 60,000 consumers buying new homes (this policy would cost the government $18 billion!!) Graphically, this is equal to a decrease in government to areas A, B, C, D and E.
Areas A, B, C and D are transferred from the government to consumers and producers. Area E is a deadweight loss from the policy. There are two things to notice about this example. First, the policy was successful at increasing quantity from 40,000 homes to 60,000 homes. Second, it resulted in a deadweight loss because equilibrium quantity was too high. Remember, anytime quantity is changed from the equilibrium quantity, in the absence of externalities, there is a deadweight loss. This is true for when quantity is decreased and when it is increased. Taxes and subsidies are more complicated than a price or quantity control as they involve a third economic player: the government. As we saw, who the tax or subsidy is levied on is irrelevant when looking at how the market ends up. Note that the last three sections have painted a fairly grim picture about policy instruments. This is because our model currently does not include the external costs economic players impose to the macro-environment (pollution, disease, etc.) or attribute any meaning to equity. These concepts will be explored in more detail in later topics. In our examples above, we see that the legal incidence of the tax does not matter, but what does? To determine which party bears more of the burden, we must apply the concept of relative elasticity to our analysis. 4.7 Taxes and Subsidies by University of Victoria is licensed under a Creative Commons Attribution 4.0 International License, except where otherwise noted.